Whipstitch dresses are fabulous with detail. 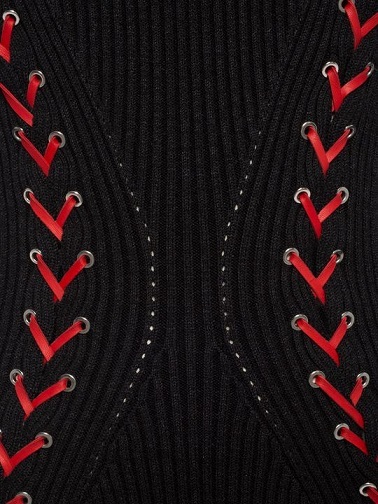 Engineered ribbed knit dresses are pierced with hand-applied metal eyelets and threaded with read leather laces. Alexander McQueen never ceases to amaze. 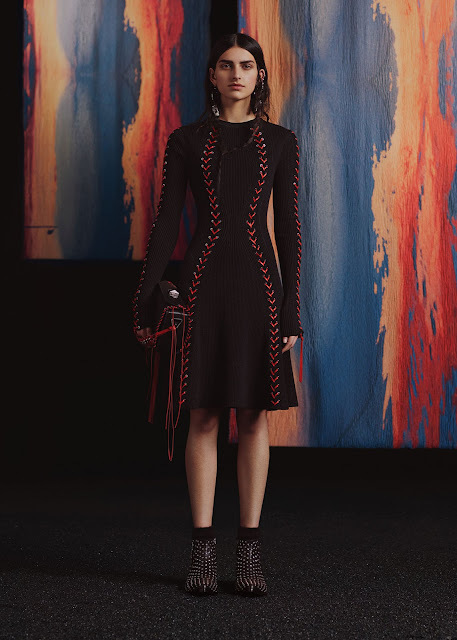 Long-sleeved, crew neck Bouclé knit mini dress with red leather laces that are laced through hand-applied silver-plated metal eyelets. The new Autumn/Winter 2017 collection is inspired by pagan landscapes, creative communities and the ancient traditions of Cornwall. Colorful tweeds and threaded leather pay homage to the spiritual Wishing Tree, whilst silk dresses and embroidered accessories reference traditional Medieval needlework. Learn more about fashion designers and designer brands. See more Alexander McQueen fashion blog posts.